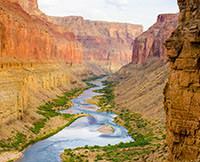 From start to finish our Grand Canyon rafting trip exceeded expectations. The incredible geology of the canyon created splendid vistas that defied description and we were enchanted by the constantly changing colours and fantastic textures of the rock surfaces that soared above us. Fantastic cacti and century plants bearing a single life-ending bloom clung to rocky slopes while big horn rams posed majestically for our cameras and comical chuckwallas performed push ups before disappearing into narrow crevices among the rocks. We enjoyed the geology and history lessons that punctuated the journey and were mightily impressed by Newty's singing and storytelling and Kurt's laconic delivery of all manner of trivia about the canyon. 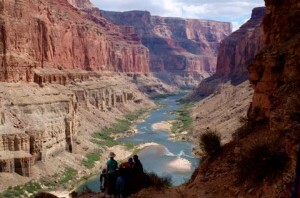 Several hikes provided opportunities to experience the canyon's special places. We'll never forget the amazing turquoise waters of the Little Colorado and Havasu Creek, the stunning views from the Anasazi Granaries, the challenging climb above the Deer Creek Falls or the incredible power of the falls themselves. We spent our nights at picturesque campsites at the water's edge, each one entirely different from the one before, and we slept beneath a sky dotted with the brightest of stars. Our meals were exceptional and there was always an abundance of food. As if by magic, Newty and his team produced delicious and imaginative dishes from the excellent produce they conjured from the storage bins on the two rafts. Who would have though we'd be eating freshly baked cakes still warm from the camp oven, perfectly cooked steaks, Eggs Benedict, ice cold vanilla icecream with Bananas Foster or fresh shrimp cocktails! And then there were the rapids! Astride the pontoons, we took what the river threw at us. Before the likes of Crystal, Hermit, Serpentine and finally Lava, the crew made sure we knew what to expect and we waited with baited breath as the expertly piloted J-Rig flew effortlessly across the glassy water before plunging into the maelstrom below while we screamed loudly in fear or relief or simply for the fun of it. We cannot imagine how this experience could have been improved nor could we have wished for a better crew or for a more congenial group of fellow passengers. We will never forget this astonishing experience. Thank you so much to all concerned and especially Newty, Kurt, Gracie and Wren.